Under a bright blue cloudless sky, Ronnie Pfiffer, Capitol Grounds and Arboretum pipefitter, stood on the West Front looking down with the focus and concentration of a Jedi. In his hands, he held not a lightsaber but a RIDGID SeekTech SR-60 Locator. The black and gold underground utility locator emitted sounds reminiscent of an anxious R2-D2 trying to deliver a message to Obi-Wan Kenobi. Upon closer inspection, the device even included two black orbs shaped like the Death Star. 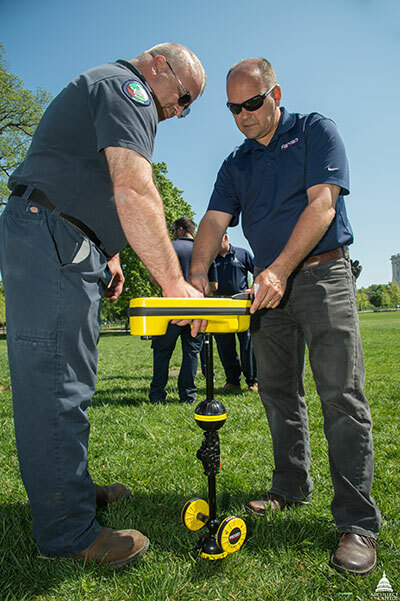 Pfiffer, his Capitol Grounds colleagues as well as staff from the Construction Division, High Voltage Section and the Office of Security Programs (OSP) gathered for a briefing on the RIDGID SeekTech device and to practice using it in a real-world setting. 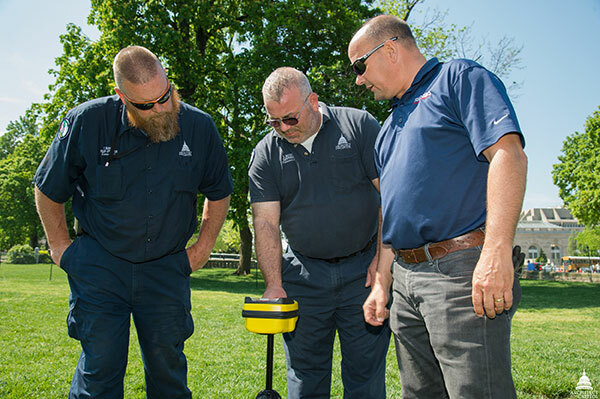 "We don't know what we have in the ground and usually find out when we dig it up," said Jason Vandervliet a facility management specialist in OSP. The SR-60 has eight receiving antennas making it easier for the person operating the locator to get a signal from buried utility lines as deep as 15 feet. Location, direction and depth of utility lines can be seen on the large graphical screen to easily trace their paths. 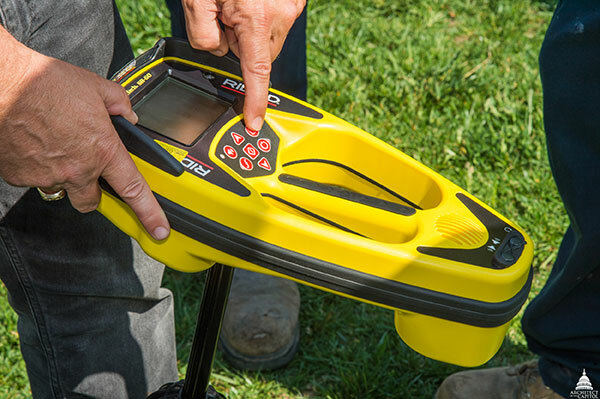 Use of the device makes locating utilities faster and more accurate in the field. 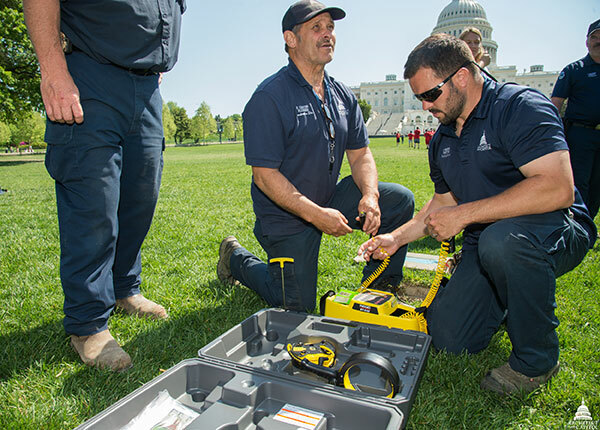 The SR-60 also enables the Architect of the Capitol (AOC) to quickly respond to requests to dig on the U.S. Capitol grounds. An individual who petitions to hold an event on the grounds, must now complete a Capitol Grounds Utility Permit to Dig that identifies the worksite, describes the work being done and provides contacts for the AOC stakeholders with utilities that might be in that area. The AOC's version of Miss Utility, this step is important to ensuring the safety of those digging and the utilities under the ground. Mark Woolridge, Capitol Grounds and Arboretum pipefitter supervisor, says that much of the irrigation on Capitol Square is a 1932 system that the AOC has upgraded intermittently. Spikes driven into the ground in support of Capitol Concerts and other events have created holes in copper pipes that the team must patch. Using the SR-60 and the Capitol Grounds Utility Permit to Dig to mark the lines prior to disturbing the soil, should help decrease the number of utility intrusions. Previously, the AOC had to rely on the institutional memories of its team. "I was on vacation and got a call from a colleague who needed to find a waterline as soon as possible. Over the phone, I told him to stand in Senate Park, find the third window on the Russell Building to the north of Constitution Avenue, go to the second bench and the line should run behind the first oak tree," said Woolridge. The addition of the SR-60 should make calls like that a thing of the past. In the words of Jedi Master Yoda, "Always pass on what you have learned." And remember to charge the SR-60!